I'm barely getting this post in on the right day! C and I had made plans for today, so he took off from work. But, then the plans got changed... so we ended up just having "a day of fun"! He has been working a ton of overtime... and I was missing him!! Today was just what I needed!! I know I did a big reflective type post yesterday, so I won't be doing that again. But, I just want to say that I have really enjoyed the last month. Coming up with something to write about each day started to get difficult, but I am SO glad that I stuck with it. I have a tendency to quit when things get tough. I hate to admit that about myself, but, there it is. I'm a quitter. I know that blogging for 31 days straight about a single topic isn't that big of a deal... but the fact that I stuck with it is a big deal (to me anyway). Here's the thing. I knew I was capable of writing everyday. And, I know I'm capable of losing this weight and getting healthy. I can look at the big picture and think about how daunting it seems. Or, I can take it day by day... and just get through the next 24 hours. Some days I worked on several blog posts in one day... and other days, that day's post was all I could manage. I think my weight loss journey is going to be a lot like that. Some days I may be feeling super motivated and organized. And some days, I may have to just focus on what I can do for that day. The thing is... the time passes anyway. I'm glad I sat down to write a post everyday... if just to prove to myself that I could. I don't mean to over simplify the task of losing weight. Obviously it's far more difficult (and time consuming) than trying to write for 31 days in a row. But, I think the same principle applies. Do what you can do today. Get through today. The days (and pounds and inches) WILL add up. That is my takeaway for this month. I can do this. And completing a challenge feels a lot better than quitting one! I did okay this month. I thought it was going to be a lot worse than it is. A lot of my goals are sort of in progress... I guess that is better than nothing. Most of what I didn't get done is money and time related. Ha. Isn't that the story of my life?! I will talk more about my November goals tomorrow!! Tomorrow I will be doing my traditional end of month blog post. I'll look at how I fared with my goals for the past month as well as setting some new goals for the next month. If you've been around here any time at all, you'll know how much I love goals and to-do lists. You'll also know that I appear to love them far more than I love doing the things that are on them! While that holds some truth, in actuality... I do have the best intentions when creating them. So, tomorrow... I will talk more about those in specifics. But, for today, I thought I would share some of my thoughts on goal setting and how (and if) it is really helpful. I'd like to think I'm pretty ambitious. Day dreaming is NOT a problem for me. I'm pro to-do lists and daily/weekly/monthly/yearly/big picture goal setting. I really do believe that you at least need to acknowledge what direction you want your life to go. Maybe you talk to friends/family about it, maybe you write it down, maybe you do a vision board. Whatever. But, there are some drawbacks to this. For me, there is no filter. I just think about it and add it to the list. My "lists" are forever long. Which is great... but it's also kind of a mess. And... sometimes I think that there is so much on my "want to-do's/need to-do's" that I am sort of walking in circles.... like I'm basically in the same place as someone who has nothing on their list. Does this make sense? I've spent a lot of this past month thinking about why I can't seem to get going with certain things... okay... ALL THE THINGS. I joke and say I'm lazy or busy or whatever. And those are definitely things to consider. But really? I think there is more to the problem. Comparison has really started to be an issue for me. It's something I definitely need to work on. But the other issue... the one that I think plays the biggest role in my forever feeling stuck... is that I have no true direction. You can see this in all of my goals (seriously I have weekly, monthly, season, and big picture goals). You can even see it in my post about my dream career. Y'all, I'm scatterbrained!! The truth is, I probably wont ever stop making these lists. But, I do need to learn to edit and prioritize. What does any of this have to do with weight loss? Well, I think this is an area of my life where it's sort of all or nothing in my thinking. And so, I set all these goals. I feel like they are reasonable enough. I mean, I should be drinking 88 ounces of water and getting at least 2 servings of fruit and vegetables. I should be doing cardio and strength training. I should be tracking my points and going to my meeting. I should be watching what types of food I'm eating. I should be getting enough sleep. But, the problem is... all these years (and for multiple reasons) I HAVEN'T been doing these things. So, though they are all pretty basic health goals... it's really asking myself to go from nothing to all the things. (Sidenote... this is just about my story/journey. I do realize lots of people would think my unaccomplished goals for the week would be a walk in the park). So my all or nothing mentality produces mega-lists with no productivity (or, very little). I can't help but wonder if I focused less on ALL and more on a few key elements... if I wouldn't have MORE success? I've had several readers email or comment suggesting just that. It make sense. And, I mean, it can't get much worse! Ha. So, while I will still make these lists (fairly certain it is in my DNA). I am going to challenge myself to pick one or two things to REALLY focus on. As for my dream of losing weight? Nothing is really changing. Getting healthy is definitely a priority for me. But the way I go about it is going to change. My weekly goals (that I posted yesterday) are still my weekly goals. But, I think right now I'm just going to focus on tracking my food. If I have time to get the points figured out... great. If I get in all my healthy guidelines and stay on program? Wonderful. But, for now... I just want to write it down (well, track it in the app). I am finishing up It Starts With Food, and I am definitely sold on the Whole 30 plan. C and I still both want to challenge ourselves. And, I am going to try and incorporate a lot of what I have learned into our daily lives. But, right now, my only focus is to just track what I'm eating. That is how I will gauge my "success" (and I use that term loosely) for the week. Once I've mastered this, or at least made it a pretty solid habit... I will decide what I want to conquer next. Wow. When I sat down to write this post, I didn't realize I would be writing a novel. But this month of writing about weight loss... while not bringing any real weight loss.. has been quite a learning experience. And, I wanted to share some of what I have been thinking about with y'all. Y'all.... I had an internal debate going on pretty much all of yesterday. Do I go to my meeting (and weigh in) or do I skip it? I KNEW it was going to be bad. I mean, not only did I completely fall of the Whole 30 program over the weekend, I pretty much fell off the WW program. I really didn't want to go and face the scale. But, I went anyway. I even stayed for the meeting. And just like those Sunday mornings where I struggle to go to church... and the sermon ends up being everything I need to hear... last night's meeting message was basically a wake up call for me. I'll share more about the topic in an upcoming post! So that's the good news. The bad news is that I gained. A lot. 1.6 pounds! SO depressing. And, if you are keeping count you'll see that I have really only lost .6 pounds this month. Not even a silly little pound. I don't really have anything to say other than it is what it is. Did I make some changes this month? Yes. I'm sure that is why I didn't GAIN weight. Did I give it my all? Nope. Not even a fraction of what I know I could have done. And, that is why I'm sitting at where I was 4 weeks ago. Anyway... it shouldn't be any surprise that I didn't do so good on my weekly goals either. Coincidence? I'm thinking not! Go to bed (lights out) by midnight every night. I'm almost done with the book (it's pretty dense with lots of science-y stuff... it's SUPER interesting... but not a "quick" read for me). I did work out once. HA. I didn't track my food (except for my good days on Whole 30) so I have no idea about the fruit/veggies and water... but I'm guessing I wasn't consistent on these. We did cook a couple of nights (but not 4). I'm sitting here looking at this list thinking "what exactly DID you do last week Tricia?". That's not a good feeling. Although, to be fair... I was sick for half the week. Though I won't be blogging about my weight loss journey everyday after this month, it will still certainly be a big part of this blog (hopefully I will find success on that journey soon!). I'm not really sure how I will go about sharing that, but I hope to at least continue the weekly weigh ins and goals. We'll see how it goes. With the exception of a few items (finishing It Starts With Food and my rewards list), these are basically my own personal "healthy guidelines" every week. They are pretty simple and should be easy to achieve. But, I clearly struggle with them. I will continue to focus on these until they become second nature... and then I will go from there. I will be back tomorrow to talk about my plans going forward. 1, It's Tuesday afternoon and I want to eat ALL THE THINGS. This is par for the course, as my Weight Watcher meeting and weigh in is in a few hours. In the past I would literally starve myself all day before my meeting. I can't (and obviously shouldn't) do that now. But, I do try to not pig out in the hours leading up to my weigh in. Of course, my mind usually has other plans. I mean, the minute I tell myself I'm not going to do or have something, my brain goes to work fighting for it. 2. I fell off the Whole 30 plan. And then I fell again... HARD. So a big component of the Whole 30 is that you don't mess up. If you cheat (intentionally or accidentally) you are supposed to start over. The premise of the plan is that you are not only working to detoxify your body and retrain your cravings... but also to deal with your emotional relationship with food. So, last week... a day or two in to the program, I cheated. It was SUPER small...and I immediately felt guilty, so I threw away the problem. I confessed to my husband, mother and a friend. And, vowed to get back on track. Which, I did. Until Thursday night, when I got SO sick. All I wanted to (and could) eat were saltine crackers. Then, mashed potatoes. The crackers are absolutely not on plan, and the potatoes could be, but I doubt the ones I had were. I finally started feeling better Sunday. But, when C got called back into work Sunday evening, I decided to ride up there with him. We stopped and got grilled chicken salads on the way. I had guacamole as my "dressing" (Whole 30 approved!) but completely forgot to cut the black beans and cheese. UGH. It seems like I take 2 steps forward and 1 step back everyday. Or maybe the other way around. 3. I'm messed up. Ha. I've been overweight most of my life. I've tried diet after diet. But, in the last year or so, I've learned so much about myself.... by just asking the "WHY?!" question over and over. I have a sweet friend that we email back and forth our weight loss struggles. I always tell her that I can't figure out why I am the way I am. I'm messed up! In all seriousness.... I think about that a lot. A LOT. I've talked a lot about the reasons why I think I've struggled (see my post on bad habits here). And those are all still very much relevant (and still very much problematic). But, WHY do I continue to do these things... especially when I recognize them as problems? I joke about being lazy, and to an extent... I am. 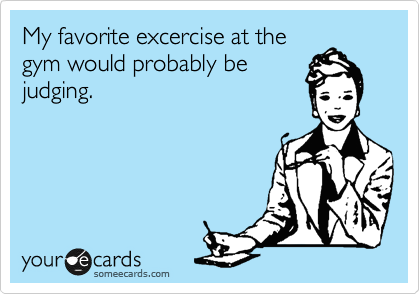 I mean, I would rather lay on the couch and read a book than work out or do housework. But, it's not like that is what I'm actually doing. I just can't figure out why, when I know I shouldn't have (insert whatever it is here) that is all I can think about? 4. I'm tired of feeling defeated. Some days I feel really motivated and successful. The scale is going down (slowly...but at least it is dropping). 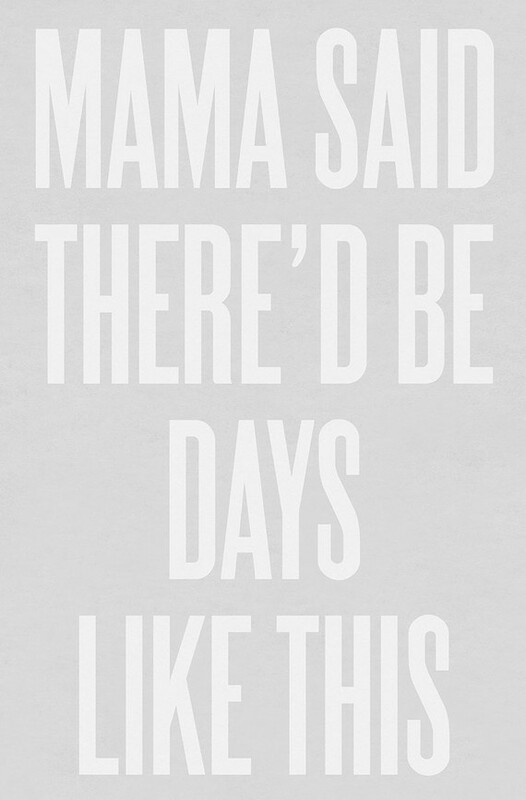 Other days? I feel like I can't do anything right... and all I want to eat is sugar. And salt. Anyway, I hate that this is another kind of "blah" post. I promise I'm not a Debbie Downer all of the time. I just wanted to get these feelings documented. I literally just googled books on overcoming laziness. Maybe I could justify laying on the couch reading one of those? I feel like I'm slowly running out of juice on this 31 days of weight loss blogging. I am looking forward to blogging about whatever I want here in a few days! But, I am going to stick with it. I mean, it's just 5 more days...and two of them are already planned out. And...I think it's really important that I complete this task. Why? Because I am really, really, really good at NOT completing tasks. I mean, in school and at work, I was always a goody goody. I got everything (plus extra) done. But, in my personal life? I have all these plans and set all these goals. Occasionally that's as far as I get (the goal setting). Or, I may start working towards something with minimal enthusiasm. And, every once in a while... I start with all kinds of willpower and motivation. But I almost always quit before I achieve my goal. And, it's one of the things I hate MOST about myself. I don't know why I can be so diligent and hardworking if it's for other people... but not put in the same kind of effort if it's for me and my own well being or pleasure. So, as silly a challenge as it is to blog 31 days about the same topic... I'm pushing myself to complete the task. It's my hope that if I continue to set these kind of challenges for myself (in all areas of my life) and actually PUSH myself to complete them.... I may just change my way of doing things. I know that other people can trust me. And that's great. But, I want to be able to trust myself!! I am excited that when this challenge is over, I'll be reporting a weight loss for the month. And, beyond sticking to the goal of writing everyday, that is REALLY what this month was about. I just need to get the ball rolling and hopefully it will pick up steam and provide all kinds of success for me. I'd like to think that next October, I could blog 31 days about what it's like to be skinny after being overweight my whole life. That's a challenge I could get on board with! I get a lot of questions about what we eat when we are losing weight. I've admitted (on several occasions) that we have a bad habit of eating out. Interesting enough, when we eat out a lot... we don't lose weight! Ha. But, there are a few things we like to cook at home that are (fairly) healthy. So long as you don't break out the cheese and sour cream (which, we usually do... ugh). Anyway, here are some of our go-to recipes. 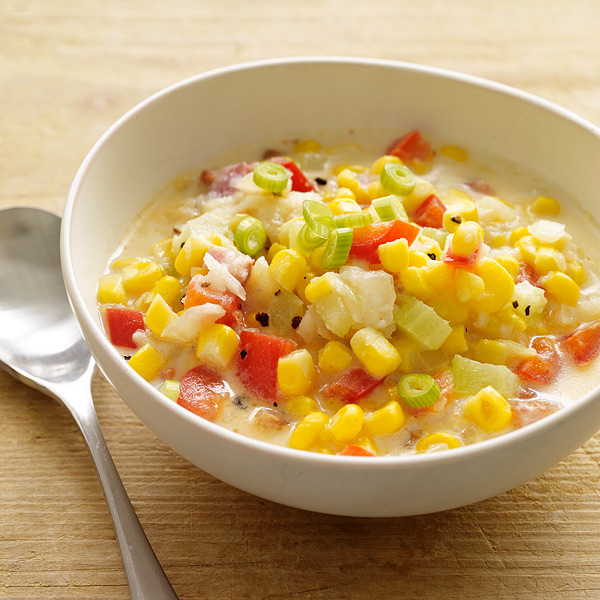 They aren't all Whole 30 approved, but you could make some adjustments to get them that way (well, maybe not the corn chowder). I think this is one that most people have seen on Pinterest. It's SUPER easy. We just put 4 boneless/skinless chicken breasts in the crock-pot, add a jar of salsa (our favorite is the Joe T Garcia's Mild). We usually just cook in on high for 4 hours and then switch it over to medium or low until we are ready to eat. Love a good low-maintenance recipe! Ha. It shreds really easy as you take it out of the crock-pot. SO good. We use it on salads, rice bowls. I also like to just mix it with some avocado and tomato and make kind of Mexican chicken salad. I made this for the first time a few years ago and we immediately added it into the rotation. I really like it the next day, after the flavors have all sort of mixed together. We don't use celery or Canadian bacon. I'm not a fan of either.. but occasionally we will just top with some regular bacon crumbles and some reduced fat cheese. Another recipe I'm sure everyone has seen on Pinterest is the baked chicken with potatoes, onions and green beans. It's all in a casserole dish with a stick of melted butter and a packet of Italian seasoning mix. Well, we made that a couple of times, but eventually decided to use about a tablespoon of olive oil (instead of butter) and no seasoning (we just use garlic powder, salt and pepper) and it was just as good. We do have to cook it will foil though, so it doesn't burn. And, we do all kinds of variations with that dish. Our standard is carrots, squash, zucchini, onions and potatoes. We make this about once a week and then eat on it for a few days. We usually steam some asparagus and have a little salad to go with. VEGGIE TIME! Ha. Occasionally we will add chicken... but we really like it without. So, this kind of a given. It's one of the easiest things to make, and my poor husband gets to eat it A LOT. Thankfully, he's a big spaghetti fan. We usually brown some onions and peppers and then add lean turkey meat. We season with garlic powder. Once that is all cooked, we add our favorite sauce (we usually get one with no sugar added). Then we may put that over whole grain noodles, or spaghetti squash. More often than not, we make it without meat, but brown some squash and zucchini with the onions and peppers and have that instead. So, those are our basic recipes. I need to try new recipes... and I set that goal every month, but we always seem to come back to these old favorites! What are some of your healthier recipes? I love weight loss success stories. Love. I thought I would share a few of my current favorite Instagram sources for inspiration. 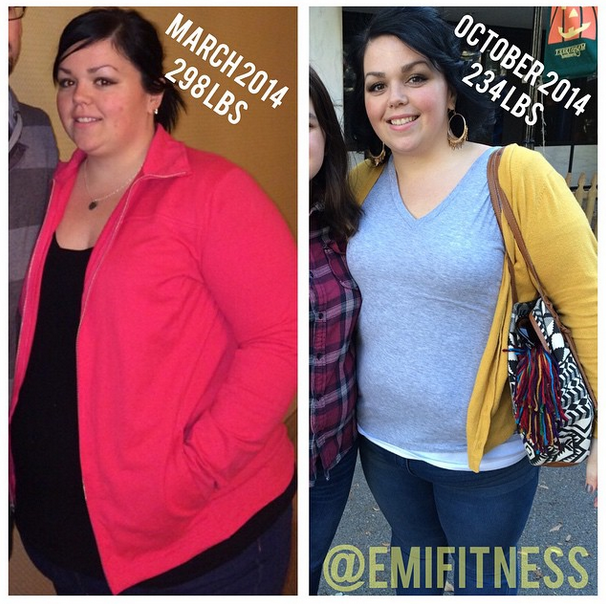 Emi just started her journey this year and is already down 60+ pounds. AMAZING!! She is on a weight loss roll...and I always look forward to her transformation pictures... because you can see a difference each week! Kate is one of the co-hosts (along with her sister) of one of the dietbets I'm doing. 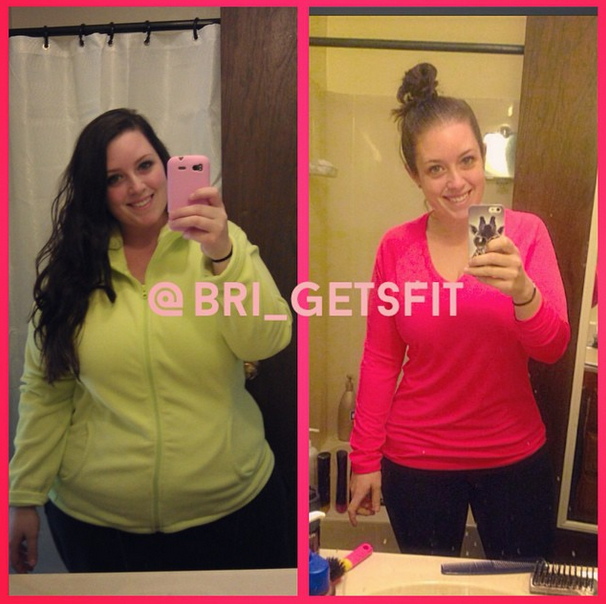 She is one of the first weight loss accounts I stumbled upon, and she has ALWAYS been inspiring! She's very real and very easy to relate with. 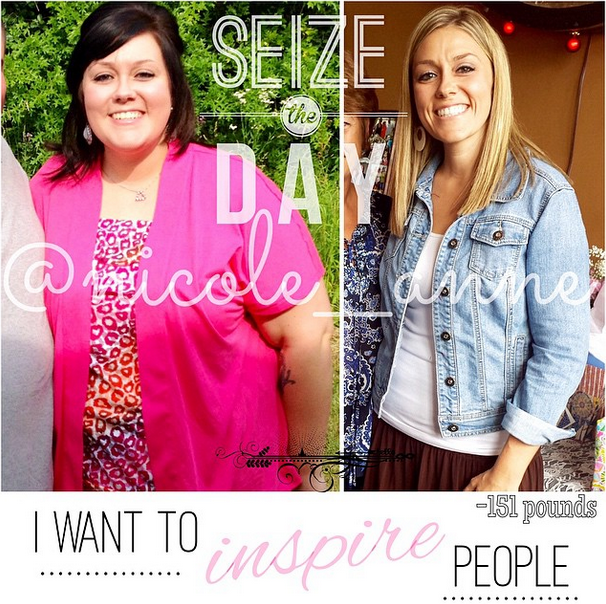 Nicole has lost 151 pounds (YES 151 pounds!!!). She looks so amazing. Bri has lost 100 pounds. How cute is she? What are some of your favorite weight loss Instagram accounts? I talked the other day about some of my weight loss rewards I have planned. Most of them are things I want to buy myself. I know it may seem silly to some, and I get that. But, I have a really bad habit of denying myself certain things because of my weight. Sometimes because it doesn't come in my size or I wouldn't feel comfortable. And sometimes, it's because of this mental block I have going on that tells me I don't deserve it. Obviously the latter is something I need to work on, but that's a post for another day! I also have lots of other rewards that aren't tied to a specific amount of weight loss. These are more like non-scale victories I can't wait to celebrate!! I thought I would share a few with y'all today. 1. Wrapping a towel around me and it covering everything. 2. Running a mile. And then running some more! 3. Being comfortable in jeans. And not having that red indentation on my waist. 4. Being comfortable in heels. 5. Losing the double chin. 6. Getting my wedding rings sized down. 7. Not being worried about booth seating being awkward (this usually is because of my height and chest... I always feel like my chest is sitting on the table! Ha). 8. Not feeling awkward, like my body doesn't match my personality. I always feel like I'm wearing a fat suit... if that makes sense. I'll be glad when that isn't the case! 10. Tucking my shirt in. I NEVER do this now. 11. Walking into a store and "normal" sizes fit. 12. Boots not being tight on my calves. 13. When people start to notice my weight loss. That is SO motivating for me! I'm sure there are several more... and I'll be sure to share them as they happen. I think beyond the number on the scale going down, any rewards I may buy myself and even the health benefits... these non scale victories are some of the best. I sometime feel like I'm missing out on all these things in life. Even if they are silly (like tucking in my shirt), they are things that bother me. It's exciting to think one day... they wont be issues anymore!! I am really starting to struggle with this 31 day writing challenge. I still have several topics I want to write about, but I just haven't had the time to sit down and fully flesh them out. I am hoping to do some of that this weekend! I can't believe next week is the end of the month. Today, I want to keep it simple. This Whole 30 program is hard for me. I'm still plugging along, but not without some serious struggles. I went to bed feeling a little defeated last night. I hate that! Even though I said I would try to cut back on weighing myself everyday, I stepped on the scale this morning... out of habit. And I weighed the lowest I've weighed in over a year. It was only about 1/2 a pound lower than my previous lowest weight (last week). And, I'm still 15 pounds HEAVIER than my heaviest weight (got that) from when I joined WW in 2012. BUT...after two years of steadily gaining, this is a welcome sight!! I'll take it!! Now, if I could just quit daydreaming about soda. I ended up not going to my meeting last night. I had too many things to do and there just wasn't enough time. But, I did want to share a little scale related story with y'all. After last weeks weigh in, I was feeling pretty great. I think that 10 pound mark got me feeling a little sassy. That mixed with the knowledge that I would be starting a dietbet and Whole 30 this week had me feeling like I could eat anything I wanted. And so I did. We ate out a lot in the last week. We always try to share our meal. We always get water. We don't get desserts or anything like that. But, clearly eating out every meal is not the healthiest way to go. So, when I went to do my official weigh in's Monday night for my dietbets... OH MY GOODNESS. I was up several pounds. My scales at home are pretty consistent with the scales at my meetings... and according to that, I was up FOUR pounds!!! So that's not good. Yesterday was day one of Whole 30 and I think it went really well (today is a different story!!). When I got on the scale this morning, I was back down to my "normal" weight. Whew. I pray that I can keep this up and see continued success. I do plan on going back to my meeting next week. In other news, I thought I would look at last weeks goals and see how I did (spoiler alert: bad). So, I kind of dropped that ball on working out and tracking (and eating fruits and veggies). I'm hoping that this week will get better with that, since I'm not tracking points... I just need to write down everything I eat (easy enough, right?). I am getting better at the going to bed earlier. I went to bed before midnight last night (now I just need to figure out how to sleep 7 hours straight without getting up 100x). I did get my before pictures and measurements done (finally)... thanks to the dietbet! I worked on my rewards list some as well. Not the best week as far as productivity is concerned... and the scale definitely showed that. So, basically, a lot more of the same. Maybe one day I won't need to remind myself to do these kind of things... they will just be healthy habits. I can't wait for that... not so much because I hate the to-do list, but because I look forward to getting healthier every week!! 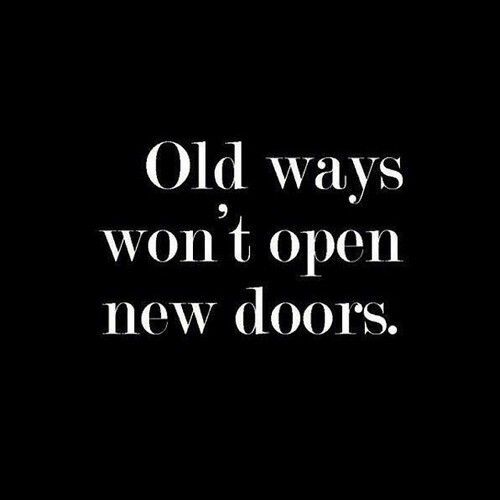 When I started on my 31 day weight loss blogging challenge this month, I really just wanted to focus on making changes. I knew that I would be doing the Weight Watchers program. I love the accountability of weighing in and the fellowship that happens during the meeting. But, I also knew that I wanted to give Whole 30 a chance (eventually). I've wanted to do it since my sweet friend Melissa did her 30 days last fall. This challenge is TOTALLY out of my comfort zone. I like all the breads I can get. And, I'm not that big on meat and eggs. I kept thinking WHAT WILL I EAT?!!! I knew doing the program would require some pretty big changes. I hate to admit this, but I started doubting myself before I even really tried. But here I am.. a little over the half way point in my 31 days of blogging challenge... and I'm starting Whole 30 and two dietbets! Ha. I'm just trying to keep the motivation train moving! You can read all about the Whole 30 program on their website, but one of the rules is that you do not weigh yourself for 30 days. Is it pitiful that this is the most troublesome rule for me? I weigh myself EVERY day. I will say that I don't get overly wrapped up in it. I mean, it's not automatically a horrible day if I'm up a pound (or 10). I just sort of do it out of habit. One of the main aspects of WW is that you weigh in every week. See my dilemma?! Ha. I have decided that I'm not going to count points this next 30 days. WW has a program that is similar to Whole 30. And, by doing Whole 30 I'll be mostly within the tenets of WW anyway. But, I'd still really like to go to the meetings. I'm not sure yet if I'll be weighing in each week (I can use "no weigh in" passes). But, I'm nosy AND I'm a rule breaker, so we'll see! I think the important thing is that I've committed to doing the program for 30 days. If I feel like my weigh in's are jeopardizing that, I'll quit. I'm also going to hide the scale at home so that if I do weigh in at WW, that is the only time I will weigh in. I know none of this matters at all to most of you! Ha. But, I thought I'd share anyway! I'll be back tomorrow with an update on day one, my weigh in results (if I do decide to weigh in) as well as my weekly goals!! Losing weight and getting healthy are reason (and reward!) enough to make some lifestyle changes. I absolutely believe this. But, for someone like me (stubborn and lazy with really, really bad habits), sometimes, rewarding myself with things can be beneficial. And... it's just plain fun! I have a lot of weight to lose. When I would lose weight in the past, it would be 20 or 30 pounds before I (or anyone else) noticed the weight loss. As excited as I was about losing weight... that wasn't very motivating. So, I like the idea of celebrating those losses as often as possible. I have a little something (and a couple of big somethings) planned for every 5 pounds I lose. 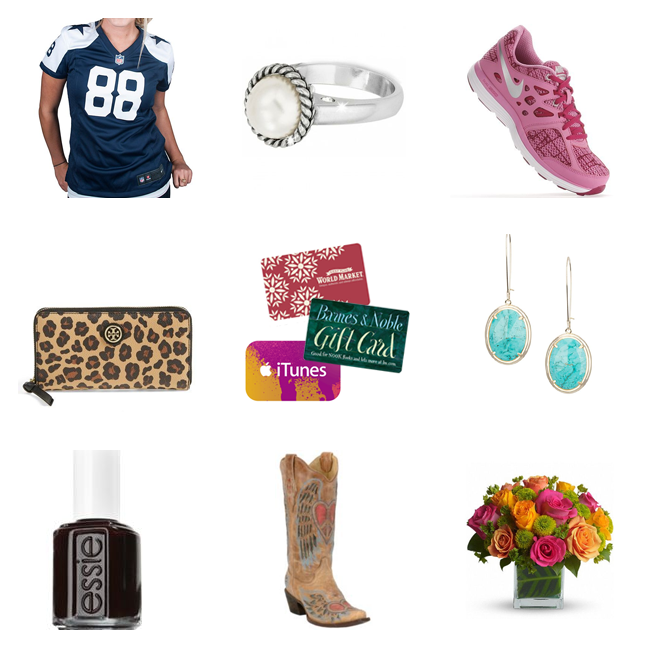 I thought I would share some of the things on my rewards list with y'all. Let me say again that I have a lot (A LOT) of weight to lose. I can't be rewarding myself with super expensive, extravagant things for every five pounds I lose (though, that would be so much fun!). So, I have lots of "small" items on my rewards list... things I would probably by anyway (nail polish, music downloads, magazines, fresh flowers etc) but that I want to hold off and instead purchase as sort of a celebration of that particular weight loss goal being met. I like the idea of rewarding myself with things that can then be used to help me as I continue on this journey. Things like workout clothes, new nikes, music downloads, fitness dvds, etc are a lot of the items on my list. I also have some "big ticket" items for when I hit a bigger weight loss goals (mostly 25 pound increments... but also some other personal milestones). I can't wait to get my Dez Bryant Jersey (still not sure where I'm going to put that on the list.. maybe 50 pounds!). For my 100 pound (yes, 100 pounds...ugh) reward... I have those super cute Corral Boots on my list. I have loved them for SO SO SO long. I am so excited that I am only 89 (only..ha) pounds away from them!!! Of course, I haven't even rewarded myself for the first 10 pounds lost yet! I better get on it!! What are some of the items on your weight loss rewards list? So, it's 11pm on Sunday night.... I guess I should blog today! We have had a really fun weekend. Which, is odd... because we really didn't do much. I guess that is the benefit of marrying someone you genuinely enjoy spending time with. But that is a post for another day. My nephews team won yesterday! They moved up an age bracket this year, but are playing against some teams that have been in the bracket for an additional year. We got a little spoiled last year... winning the league Super Bowl. This season has been a bit trickier. But... we are now 3-3 and have a chance at the playoffs! Yay! 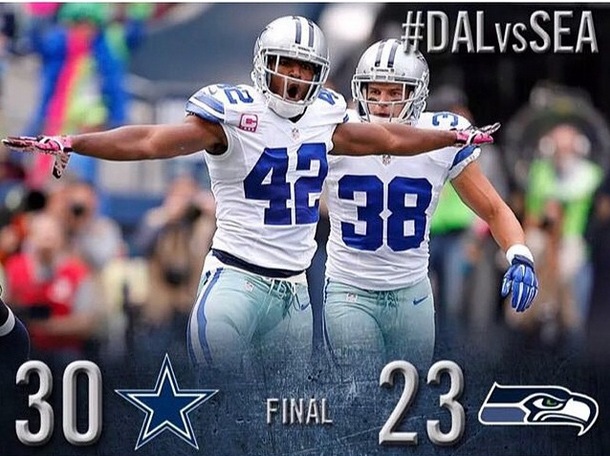 The Cowboys are 6-1 after today's win. I can not even handle it. I'm so excited. SO SO SO excited. I'm a huge Cowboys fan. I have ALWAYS been a huge fan... even when the games weren't as fun to watch as they are this season. But, this is a blast!!! I have been plugging away at the book. It is REALLY interesting. I swear, I am seeing myself in almost everything I have read so far (all the bad stuff!). Ha. I am planning on starting my 30 days Tuesday. I'm nervous... I'm not always the best at sticking to things... but I'm going to try and blog/share on social media as a way to keep me accountable. I mentioned joining a DietBet in Friday's post. I ended up joining TWO! Yikes. Talk about motivation... I need to get my money back!! Ha. I will do my official picture taking and weigh in tomorrow because both bets start early this week! SO basically... my last "free" day is tomorrow. I start Whole 30 and one of the bets on Tuesday and then the other bet the next day (each bet runs 28 days). And I have been OVERLY aware of this. And... I have unfortunately used it as an excuse to eat poorly all weekend. Like, way bad. It's as if I got so wrapped up in this "stuff" I'm going to start this next week, that I forgot that I am already trying to make (permanent) changes. I need to remember that it isn't some one-off thing. I am wanting to continually move towards a more healthy life. I clearly have a bad relationship with food. This weekend has just been another eye opening experience for me in regards to that. I pray that I make it through the entire 30 days of the program. I hate that I'm already worried about not being able to do it faithfully. I am declaring right now that I am going to succeed in this 30 day challenge. I mean, goodness gracious... it's only a month. I pray that it changes the way I think about food. Of course I want to lose weight (preferably over 4%... so I can get my DietBet winnings! ha)... but I really, really want to change the way I eat. Instead of thinking about how tomorrow is my last/only chance to eat poorly (I'm looking at you french fries and Coke) I'm going to think about how tomorrow is one day closer to changing my relationship with food. Instead of thinking about how this is going to be so difficult, I'm going to think about how much of a blessing this can be to me. I hope y'all had a great weekend!! I hope we all have an AMAZING week!! I'll be the first to admit that I'm not near active enough. It's not like I lay in bed all day, but I certainly could stand to move around a little bit more. I somehow managed to get a job at a gym the summer after high school graduation. I worked mostly in the daycare, which was about as far away from the gym floor (where all the classes and machines were) as you could get. We got a free membership as an employee perk, but for about six months... the only part of that I took advantage of was the tanning booth (yikes!). One of my personal trainer friends cornered me in the break room one afternoon and told me she had a cancellation. She asked if I wanted to work out with her. I was overweight (though, I was significantly smaller than I am now...sigh). And, I hadn't really worked out in about three years... since I quit playing soccer. I was really intimated by all the machines and equipment... not to mention I felt like I would stick out like a sore thumb. But, I was too embarrassed to tell her no. I remember walking up the stairs to the workout area thinking that was going to be humiliating! Turns out... it wasn't so bad. She showed me how everything worked, and I what I needed to do to for the best results (cardio + strength training). I sort of ignored the spiel about weight training, but I totally bought into the cardio. I started working out almost everyday after work. I ended up losing about 50ish pounds in less than a year. I went from not working out ever, to becoming obsessed with doing cardio (mostly walking and stationary bike) to not working out again. I know my constant extreme workout sessions weren't healthy, but I often wish I would have found a happy medium and stuck to it. Can you imagine how different my life would be now? But, there is no point in dwelling on that too much. I am trying to get back into a routine. Of course, I'm 17 years older (that PAINS me to type), so I don't have the time or energy to walk 4 hours a day (seriously, I used to walk that long most days). But, I need to do something. I've been doing the stationary bike. It's really easy to do as I have one in my dining room (ha!). But, it's getting a little boring, and I know I need a bit more challenge. I've got some workout dvd's I need to dig out. I LOVE the Walk Away the Pounds DVD's. They are kind of cheesy... but some of the 3 and 4 mile ones are a pretty good workout (for me, anyway). Once again, I find myself with a free gym membership (we have a gym in the amenity center where we live)... and I NEVER GO. It's not so much an intimidation thing now... as much as a talk myself out of doing it thing. But, I need to get over myself and just go. I know I will feel better (and no doubt look better). What do y'all like to do for cardio or strength training? It's Friday!!!! 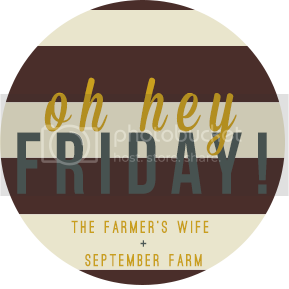 I'm feeling lots better than I was yesterday, so I'm celebrating with a Friday Fives type of post. Linking up here, here, and here! 1. I'm still pretty pumped about hitting the 11 pounds lost mark. I have spent months getting as close to 10 pounds lost as possible...without actually losing 10 pounds. I was gaining and lose the same pound and half over and over and over. 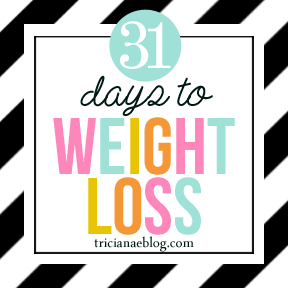 I really do feel like this 31 days of blogging about weight loss has been SUPER helpful!! I've got a long, long way to go... but I've got my eye on 15 pounds... then 20 and so on. I can do this!! 2. 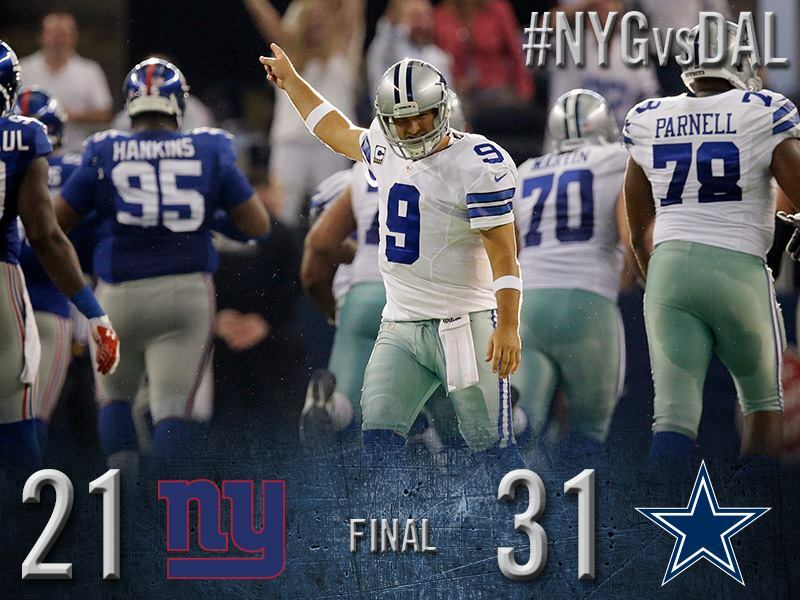 The COWBOYS. Y'all. I am blogging about weight loss this month, so I haven't talked much about anything else. But, I can not go without celebrating the big win last week. We were watching all the pregame shows and everyone was picking Seattle. I was rolling my eyes all over the place. I mean, I was nervous... we were playing the Super Bowl champions. BUT... I just knew that we (and I use the word "we" like I am actually on the field. ha). could do it. And, we did! I may be crazy (go ahead and laugh) but I actually had tears in my eyes with that final interception that ended the game. 3. I am not domestic at all. Oh, I wish I was... and I love to dream about being a little homemaker. Maybe one day I will fulfill that dream, but now? Not so much. Anyway, I couldn't sleep the other night, and I was laying in bed thinking about food (ha!). I was craving vegetable soup so the next day I picked up everything from my late night made up recipe day dreaming. It turned out pretty good. Was a little bland... so next time, I might try more seasoning or something. It was SUPER easy. I just browned some onions and bell pepper in pot (with olive oil). I sprinkled some garlic powder on them while they were cooking. Then I added a bag (frozen) each of: corn, french cut green beans, carrots and peas (these were in one bag together). I poured in about 3 cups of organic/low sodium veggie broth and added some diced red potatoes and a small can of tomato paste. Yum Yum. 4. I won a giveaway sweet Ryan was hosting. 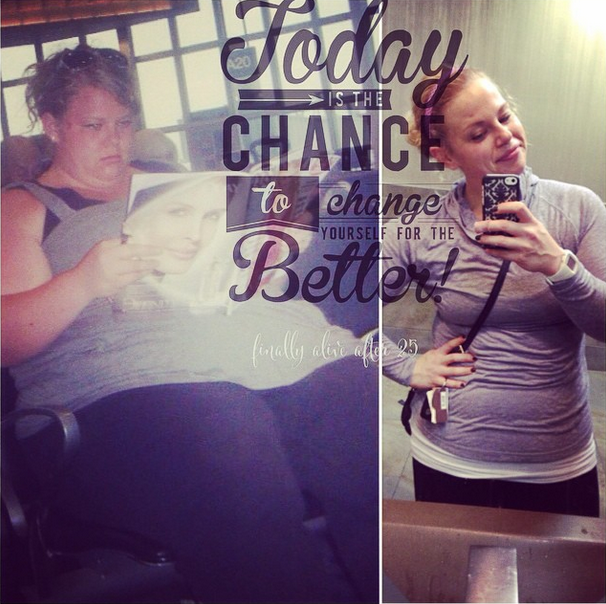 She has been SUCH a huge inspiration for me in the weight loss arena. She was giving away a couple of copies of It Starts With Food by Dallas and Melissa Hartwig. I have been tossing around the idea of doing Whole 30 for a while now. I tried to get the book at the library the other day and apparently lots of other people had the same idea... there were like 15 people ahead of me. The next week, I won a copy from Ryan! Yay. I got it this week and am several chapters in. I'm hoping to finish it this weekend and start next week!! Have y'all done a Whole 30? What did you think? Any recipes? 5. Speaking of next week, I am starting my first ever DietBet. Have you heard of this? You pay a fee (mine is $35) and then you have 4 weeks to lose 4% of your starting weight. If you achieve this, you split the pot of entry fees with everyone else who hit their goal. I'm SUPER excited. I think this will be a great motivator. I do like keeping my money!! Ha. If y'all want to join, email me and I will send you an invite to the bet I'm participating in. It starts Tuesday! I try to start my posts the night before and then work on them a little bit more the next day before posting. I never did that last night... and I just now realized that I hadn't posted today!! Yikes. I was tempted to just skip today's post all together, as I don't have anything planned. But, I am trying to complete this 31 day challenge, so here I am. I had kind of an off day. This may be completely in my head, but I think I have foggy brain when I eat too much bread/pasta. Does this happen to y'all? I really try not too eat a lot of bread, mostly because it's a trigger food for me. But, it seems like I've had it more this past week. And, I really think that was my issue today. I just couldn't seem to get motivated to do anything. I had to drag myself out of bed. 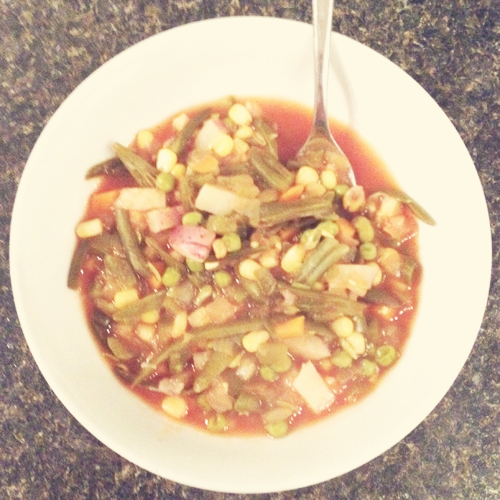 I ate some homemade veggie soup leftovers (pretty good for a "made-up" recipe). But, like a goober, I had some bread with it. Then I finished off the day with a burger, fries, coke AND some (shared) ice cream with the hubs. Lovely. Ha. Of course all of this booty-dragging may have absolutely nothing to do with bread or my diet at all.... and EVERYTHING to do with my super loud neighbor. He gets home around midnight and then C and I swear he does Crossfit or something for about 3 hours. I was laying in bed the other night and I would have bet money he was throwing weights across the room (he's our upstairs neighbor). We have decided that he has a rocker/recliner right above our couch...because we can literally here him rocking the chair. We've never had noise issues in an apartment before, but this is crazy. I could cry it's so frustrating. So, today was probably one of the most difficult one's this month... food, activity and motivation wise. But, I guess those happen to everyone. I just need to recognize it, and move past it. In the past, these kind of days would turn into "these kind of weeks/months". I want to make sure that I don't let that happen! At least tomorrow is Friday! Here's to it being 10x better than today! So, bad habit or not, I get on the scale daily. I know people say you should only weigh in once a week, but I just can't seem to break that routine. I just do it as sort of a self check. Normally, I don't attach a lot of emotion to what it says. Until this past Monday. It was down the lowest it's been in about a year!! That got me pretty pumped! So, I was really looking forward to my weigh in last night. The weigh in wasn't as good as my scale at home, but that's okay. I'm down 1.2 for a total of 11 pounds!! WOOT WOOT! I am finally feeling like I am in the right frame of mind again. And, that is such a big blessing. One thing I've repeated to myself over the last 2 years is WHY CAN'T MY MIND GET ON BOARD?!!! I mean, I've done this before with success. I know what to do, and know I'm capable of doing it. But, I just couldn't make myself do it. Being down 10+ pounds is pretty motivating though. I have a long LONG way to go, but this is definitely a big step in the right direction. Blogging everyday, yay! I got in cardio 3x. I am doing 20 to 25 minutes on the stationary bike at our house. I do want to mix it up and maybe step it up this next week though. Getting in my water is pretty easy for me. Went to my WW meeting... but again... didn't stay. And, I did cook at home 3x last week. I made oven baked fajitas, chili and baked chicken and veggies. We also made breakfast Sunday morning, and let me say... C and I both agreed that homecooked food is just so much better!! I also need to be a little more disciplined on my daily to-dos. But, I will say that I have been getting more done each day, so that is a good thing. Eating out. We did cook at home more this week and had leftovers, but we agree that we need to do that even more in the future. I didn't do my strength training. No good reason, just kept putting it off. I do really want to try and get that in this next week!! I need to work on the tracking thing a little bit more... I do it about 30% of the time... which isn't near enough. I think if I were more diligent about it, I would be more likely to get in my fruit and veggies! I don't really have anything that was just horrible this week. I need to continue to work on my sleep schedule...but it's improving already. I have started getting "treats" more during the week... like a bag of m&m's or a slurpee. It hasn't had a negative effect on my weight... but I know that if I don't quit that pretty quick...it can and will get out of control. I technically have before pictures and measurements from a few months ago when I went back to WW at my highest weight. I decided that I didn't really need new ones at the beginning of the month when there was only a 8 pound difference. But I am going to take pictures and measurements tonight, and continue to do so in 10 pound increments. Okay... so on to the next week, basically more of the same. Do y'all love gifs? Sometimes I see them and think they so accurately portray how I feel... that I really have no need to speak anymore. I thought I would share a little gif/weight loss story with y'all today. How I feel some days. When I'm eating something healthy instead of what I really want. When I'm trying to find something to wear. When I'm feeling sassy at the scale. When the scale doesn't say what I want it to. Sometimes I'm kind of lazy. Sometimes I do work out! But, most of the time, I'd rather not. My motto the last 15 years. Funny stuff. I'll be back tomorrow with my weigh in results!! I'm feeling pretty sassy (see above)!! Sometimes it's just easier to focus on the bad. I don't know why that is, but I'll be the first to admit that I can always pick out what went wrong before I can recall what went right. When I wrote yesterday's blog post about my bad habits (well, those that relate to my weight loss journey anyway), I realized that I could go on and on and on about all the things I do "wrong" or "bad". But I didn't want to just leave it at that. Even though some days are a real struggle, I know that (even) I have some redeeming "good" qualities/habits that can benefit me as I try to lose this weight and get healthy! 1. Seek the positive. Sure, it is easy to see the bad. But, I always challenge myself to try and find something good in even the worst situation. I've been doing that at night the last week or so. I may not have tracked my points or got in all my fruits or veggies, but I'll remember that I drank water instead of soda at lunch. Or maybe I went ahead and did my workout even though I didn't really have time (or want to do it!). I don't ever want to go to bed and think that the day was a complete failure...because it NEVER EVER EVER is. 2. I like to celebrate the small stuff. If I did drink water instead of coke? You better believe I'll high five myself. Or, more than likely I'll tell C and then we'll high five. I've been known to say "at least you're trying" to myself on LOTS of occasions...even if "trying" is a stretch. Some might say this is being too easy on yourself, but I know that I can be my own worst critic.... so it's good to have some positive vibes, right?! 3. Not giving up. Ever. Sometimes I really do feel defeated on this journey. I'm sure there have been several times when I thought "why bother?". But I try and snap myself out of those moments real QUICK. I know beyond a shadow of a doubt that one day, I will no longer be overweight. I know it deep deep down in my heart. And, because of this, I won't give up. I mean, it's kind of embarrassing how many times I've started and stopped and then started over. But, not near as embarrassing as starting and stopping and then never starting again. 4. Cheerleaders. This isn't so much something I do, but more the people I surround myself with. I have a great circle of family and friends that cheer me on. When I was losing weight before, I would post (on Facebook) my weigh-in results every Tuesday night...and if I was late or missed a Tuesday, I had several messages wondering why I hadn't posted! Talk about accountability!! My grandparents requested a phone call every Tuesday night and it was always the big celebration when I would tell them I lost. (I really did lose almost every week...even if it was only 1/2 a pound...there was a celebration!). 5. Knowing my stuff. I've read lots of books on eating healthy, watched televisions specials, listened to Doctors talk about weight loss methods. And, I'm always looking to learn more. I think this is a really powerful tool...I just need to put it all to use! Ha. 6. I like healthy foods. I really do like salads and fruits and veggies. Sure, I enjoy the bad stuff a little bit more. But, I'm not one of those people who wont eat vegetables. 7. Wanting it. I want to be thin. And, I want to do what it takes to be thin and healthy. I think that is key. I mean, I've always wanted to lose the weight, but there have been plenty of times where I just felt like I didn't really want to put in the work. Sounds awful, but it was the truth. 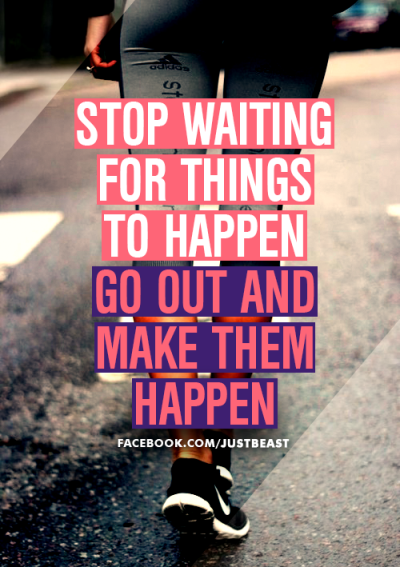 I think wanting it + wanting to do it is the magical combination!! You know, it's a little challenging to blog 31 days about weight loss when you aren't losing weight everyday. I sit here, staring at the blank screen wondering yet again WHY I chose this topic? And then I remember, it's not just about getting skinny. Sure, that is the motivation. But, the real reason I chose this topic is to think more about losing weight. That sounds absurd, as anyone with weight issues will assure you that there is rarely a moment when they don't think about it. But, instead of focusing on the physical frustrations and past failures, I wanted to challenge myself to think about WHY I'm fat. WHY I have failed in the past. WHY I am not happy in my own skin. WHAT I need to do to change these things. And, honestly? WHAT I'm willing to do. So, today, I'm going to dig a little deeper into some of my bad habits. I've talked about my sleep schedule being a road block, as well as eating out too often. 1. Soda. Oh Y'all, I do love Coke. I used to joke that I would rather give up food than soda. Obviously this is bad for my weight... but also really bad for my health. I have tried to give up soda SO many times. But, it's a tough one. 2. Starting and stopping. On one hand, it's good to never give up. On the other, it's wrecking my metabolism. 3. Comparison. It truly is the thief of joy. I look at other girls and hate myself for not looking like them. I almost always assume their lives are probably far better than mine. Which, I know is crazy. Just like I know that when I lose all my weight, I won't magically be living a fairy tale. I also struggle with comparing my weight loss journey to others. I love to be inspired and motivated by those who have found success on this journey. But, if I'm not careful, I will find myself getting jealous of how much they have lost or how motivated they are. It's not a competition! 4. Not eating breakfast. Well, that and not eating a lot of food in general. I mean, I KNOW for a fact it's not an issue of not enough calories. But, I don't think it's healthy to get all your calories scrunched up within a few hours. Because of my sleep schedule, it feels like I eat lunch, then a few hours later... eat dinner. I need to make better food choices. I also need to make sure that my calories are being spread evenly throughout my day. 5. Not working out. I have started working out again, but I know that I nowhere near as active as I should (and could!) be. I remember when we first moved back to where we live now, we tried to go for a walk and I could not even walk 1/4 of a mile without being completely worn out. I couldn't believe how out of shape I had let myself get over just a year. Thankfully, it's gotten a little better. 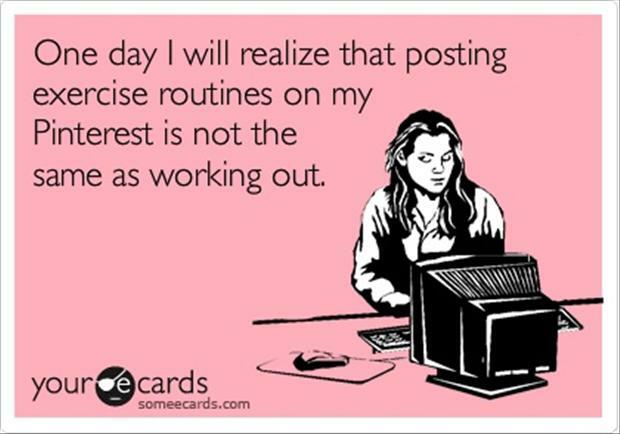 But, I need to make exercise a routine part of my life ... FOREVER. My life will be so much better because of it. 6. Processed. Processed. Processed. This is something that is thankfully getting better. But, there is something really addicting about fake food. Cereal anyone? 7. Not tracking my points/meals/calories. This is the MAIN aspect of Weight Watchers. When I do it, I lose weight - without fail! So, I'm not real sure why it is such a difficult thing for me to do. It doesn't really take that much effort. I just can't seem to MAKE myself do it. I'm sure if I kept thinking about this, I would come up with several more. But, I'll try not to be too hard on myself today! Ha. I'll be back tomorrow to discuss my good habits! There's got to be a few!!! Do y'all have any bad habits?